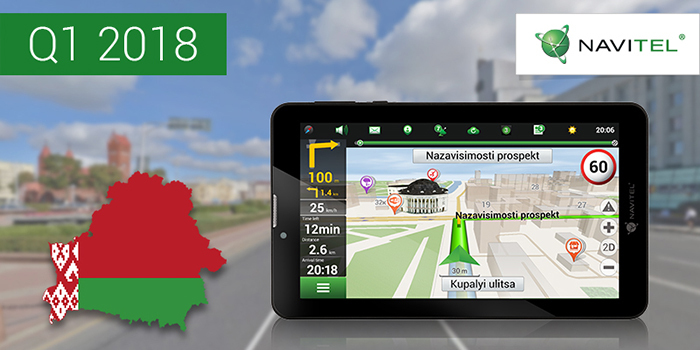 NAVITEL® has carried out a large-scale map upgrade for the Republic of Belarus. The latest Q1 2018 map update is already available for NAVITEL® navigator as well as for Navitel Navigator app users. NAVITEL® announces a substantial map update for Belarus, which was implemented as a result of cooperation with the National Cadastral Agency of the State Committee on Property of the Republic of Belarus – the official state source of cartographic information and research. «The quality of user experience, when it comes to navigators, is in direct correlation with the quality of the mapping material. It is our priority that up-to-date information is available for our users, the data they can trust. In order to do so, we are providing high density of information important for navigating», Alexander Kazakov, the President of NAVITEL® group of companies, points out, «Thanks to the National Cadastral Agency of Belarus we have successfully created a truly unique navigation map for our users». The longstanding partnership has allowed integrating the full official list of buildings, traffic network and all information crucial for effective navigation into NAVITEL® navigation map. Expansively detailed map update allows the user to access up-to-date information about all the registered constructions, including the new builds. The address database of all cities and settlements, allotments and agro-towns was revised, which has expanded the cartographic data substantially. The number of cities and settlements with address search has grown by 57 times, while the total count of addresses available in NAVITEL® map has exceeded 2 million. The map also includes 3D-objects of municipal importance – landmarks, railway stations, churches and stadiums among others. In comparison with the previous release, the database has increased significantly and the number of highly detailed settlements in NAVITEL® Navigator has surpassed 25 000. «For many years NAVITEL® has been a valuable strategic partner for us. They managed to make the map 100% "alive", making it useful both for our fellow citizens and guests of the republic. The tradition of integrating official databases into NAVITEL® Navigator indicates their professional approach when designing products», says Sergey Levchik, First deputy general director of the National Cadastral Agency of the State Committee on Property of the Republic of Belarus. 17 objects in 3D graphics. 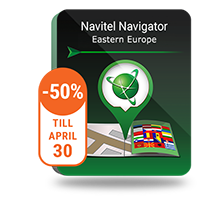 The map update for the Republic of Belarus is already available for NAVITEL® navigator in Navitel Navigator Update Center. Please note that the maps of the Q1 2018 release work with Navitel Navigator version 9.7.2493 onwards.